I read an interesting Brief from BNP Paribas (published August 7, 2012) today – The Bundesbank’s Bond Purchases in 1975 – which documents the seemingly hypocritical stance of the 2012 Bundesbank against the way it behaved in the mid-1970s. The short BNP analysis is in the context of the recent demands by the senior Bundesbank officials (including the chief Jens Weidmann) that the ECB refrain from purchasing Eurozone member-state bonds as a way to alleviate the current crisis. The point of the historical reflection is not, in my view, to bash the Germans for hypocrisy but to view their actions in 1975 as a sensible policy response to the growth crisis the German economy was enduring at that time. The same sort of action by the ECB would help the Eurozone get out of its growth crisis now. In 1975, the Bundesbank showed the way. In recent weeks, the BuBa has been putting increasing pressure (via various public presentations and statements) on the ECB Governing Council (and ECB boss Mario Draghi personally) to refrain from any further government debt purchases. The ECB has been running two programs (at varying intensities) over the last few years which have had the effect of saving the Eurozone from collapse. The Securities Markets Program (SMP) and the Long-Term Refinancing Operation (LTRO) have in their own ways channelled Euros into member-state bond purchases. The critics, like the BuBa officials claim that these programs have compromised the ECB’s independence. For example, they say that the ECB’s Securities Markets Program (SMP) – established on May 14, 2010 which involves the ECB buying bonds from governments which the bond markets will not lend to at reasonable rates – but the purchasing is via the secondary market from banks who took the primary issue, violates the no-bailout clause in the ECB Statutes. … overdrafts or any other type of credit facility with the ECB or with the national central banks in favour of Union institutions, bodies, offices or agencies, central governments, regional, local or other public authorities, other bodies governed by public law, or public undertakings of Member States shall be prohibited, as shall the purchase directly from them by the ECB or national central banks of debt instruments. The conclusion is that the SMP is a violation of the “intent” of the rules. I agree. But at least the ECB has had the sense to realise that without the SMP Greece and probably other member states would be totally insolvent by now (the appalling 70 per cent Greek haircut notwithstanding). The SMP is ensuring that yields on precarious public debt issues are being kept down. The participants in the primary issuing market know that the ECB will operate rather vigorously in the secondary market when required. The point is that the “rules” which established the EMU (and the role of the ECB) were ideological and reflected the unsubstantiated assertion that the “business cycle” was dead and that no recession could be bad enough to upset the financial system and cause governments to grossly violate the Stability and Growth Pact fiscal rules. Please read my blog – The Great Moderation myth – for more discussion on this point. I won’t go on to discuss the LTRO, which has made billions of Euros available to certain banks (around 800 or so) in the Eurozone, which have seemingly found their way into bond purchases. The critics say this facility offered by the ECB violates the no bailout essence of the Eurozone treaty and will be inflationary as a result of the liquidity spike. The no bailout argument is being used again to mount pressure against any further ECB bond purchases. “Wall of Money”, which has meanwhile reached a height of €500 billion. Ring-fencing is certainly a sensible approach, but just like the “Tower of Babel” the “Wall of Money” will never reach heaven. If we continue to make it higher and higher, we will, in fact, run into more worldly constraints – both financial and political ones. So he was explicitly rejecting the argument that Germany’s deliberate repression of domestic demand (via harsh labour market reforms) should be reversed to provide a reduced reliance on exports in that nation for growth and some demand stimulus via increased German imports for the rest of Europe. He reaffirmed his support for fiscal austerity quoting the British Chancellor as his authority. Usually, the boundary between monetary and fiscal policy is clear-cut for good reason. Once a central bank becomes involved in fiscal policy, it eventually loses its independence and its credibility as an inflation-fighter. This is the story told not only by economic theory but also by historical experience. Just think about the unholy “marriage” between Banca d’Italia and the Italian treasury in 1975. Banca d’Italia promise of marriage was to act as buyer of last resort for government bonds. Until the “divorce” in 1981, Italian government debt more than tripled, while average inflation stood at 17%. After Banca d’Italia was granted greater independence, inflation rates began to fall significantly. I thought about that statement when I read the BNP Briefing. My reaction was what about Germany in the mid-1970s. The BNP Brief provides a link to 1975 Deutsche Bundesbank Annual Report (in German) which details some of what went on then. The BNP Brief provides a link to an article in Der Spiegel (October 27, 1975) – Bundesbank: Der Freund fehite (Federal Bank: The friend went missing). Monatelang kaufte die Bundesbank den Banken und Sparern für insgesamt 7,6 Milliarden Mark Staatsanleihen ab. Jetzt stellte sie den Ankauf ein und gefährdet damit den Wirtschaftsaufschwung. By which we understand that the Bundesbank had for some months bought from the private banks and other holders of bonds (Sparern) a total of 7.6 billion dollars in German government bonds. The massive bond purchasing programme was then terminated and this was jeopardising the economic recovery. The BNP Brief says that the purchase of long-term bonds in the secondary markets by the Bundesbank were “worth around 1% of GDP.” So not insignificant. By way of historical record, Germany had a very severe, though short-lived recession in 1967. It recovered fairly quickly but then the OPEC oil price hikes in October 1973 pushed it back towards recession. By the March-quarter 1975, real GDP growth was negative and, unlike 1967, when the rise in unemployment was moderate, the 1975 recession saw unemployment climb sharply. They had floated the exchange rate (against the US dollar) in March 1973 (although they agreed to a peg with five other European economies) and had run restrictive monetary policy to insulate the economy against importing the relatively high US inflation at the time. The restrictive monetary policy had influenced the rising appreciation of the German Mark which insulated the economy from the OPEC-induced inflation that beset most nations by 1975. The downside of the appreciating mark was that the domestic recession was deeper as German manufacturing exports were rendered less competitive. The cyclical downturn had also pushed the budget deficit up although inflation was contained and falling. However, the fear of inflation appears to have reduced the private demand for long-term government debt and as a result yields were rising. That explains the motivation for the large-scale government bond purchases by the central bank, which had the effect of driving bond yields down substantially. Inflation continued to fall after the interventions. The Bundesbank had for some weeks been buying government debt and when it became known publicly (the then Bundesbank boss accidently admitted it), the central bank had to undertake some rapid public relations work – given that the bank was legally prevented from “monetising the government deficits” (“… gleichzeitig die Finanzierung der öffentlichen Defizite erleichtern”). That is, they massaged the practice within their “rules” by claiming it was a liquidity operation (an act of monetary policy) aimed at maintaining the normal monetary transmission mechanisms. Which is exactly the same argument that the ECB has used recently to defend its SMP – that it is a policy designed to faciliate the normal liquidity operations – open market operations to ensure the target interest rate is maintained and liquidity conditions are suitable. Please read my blog – Don’t tell the Germans – the ECB weekly deposit tender failed – for more discussion on this point. Remember this Speech in February 2012 – Monetary policy at crisis times by Peter Praet, Member of the Executive Board of the ECB. From the onset of the crisis, the ECB has also embarked in a series of non-standard measures – as they are usually labelled – aimed at preserving the proper transmission of monetary policy. … the goal of all these measures is to maintain the appropriate credit supply to households and firms, to ultimately guarantee price stability in line with our mandate. That line has been recurring from a number of presentations made by the ECB officials over the last few years. But it was exactly the line taken by the Bundesbank in 1975 when it acted (sensibly) to prevent the recession in that year worsening. Its actions were sound and inflation moderated while real GDP growth bounced back fairly strongly the next year. The unemployment rate declined in 1976, albeit modestly. Clearly, an institution can decide to alter its behaviour under new leadership and establish a new direction eschewing its past. But the debate in 1975 and the public posturing of the Bundesbank was very similar to that of its current position. There has been a consistent thread running through its history (since it was established in 1957). Article 3 of the Bundesbank Act of 1957 talks about its mandate in terms of “safeguarding the currency” and prioritising price stability. That emphasis is why the Bundesbank suspended its official foreign exchange market interventinos on May 5, 1971 just prior to allowing the currency to float against the dollar. They were fearing that the inflow of US dollars (seeking Marks) as the US trade situation deteriorated at that time. So I don’t think the current Bundesbank officials can claim to be carving out a new approach. Further, remember last November when the German government’s 10-year Bund tender (auction) failed and the government resisted the rise in yields by effectively “purchasing” 2,356 million Euros-worth of the issue. They subsequently planned to sell the debt in the secondary market. Please read my blog – Going right to the top in Europe – for more discussion on this point. The German government manipulated its own rules – by withdrawing much more to sell in secondary markets than it could justify for operational reasons – in order to keep the official Bund yields low and bail itself out when the private bond markets were not willing to fund it on their terms. While the German central bankers and government officials have been preaching to all and sundry about their insistence that the ECB should not be funding government deficits, what the Germans did in November 2011 was not that far removed from being just that. And what about the German violations of the Stability and Growth Pact rules from 2001 to 2005. I discuss that in this blog – The hypocrisy of the Euro cabal is staggering. 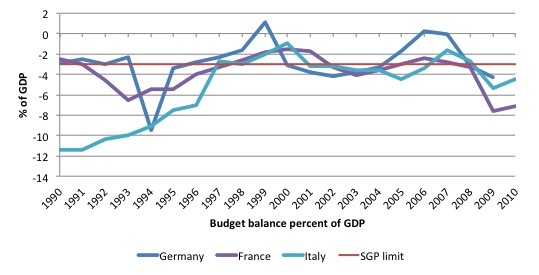 By way of summary, the following graph – using the detailed government expenditure and revenue data available from Eurostat shows the annual evolution of the Budget Deficits (as per cent of GDP) for the “core” EMU nations (Germany, France, Italy) from 1990 into the convergence period leading to the creation of the common currency and to 2010. The red line is the SGP upper limit deficits (3 per cent). Between 2001 and 2005, Germany violated the Treaty without penalty. France violated it between 2002 and 2004 and Italy between 2001 and 2006. The so-called corrective arm of the Stability and Growth Pact is called the excessive deficit procedure (EDP) which the EU’s ECFIN calls the “dissuasive arm”. The EDP is triggered by the deficit breaching the 3% of GDP threshold of the Treaty. If it is decided that the deficit is excessive in the meaning of the Treaty, the Council issues recommendations to the Member States concerned to correct the excessive deficit and gives a time frame for doing so. Non compliance with the recommendations triggers further steps in the procedures, including for euro area Member States the possibility of sanctions. The Treaty allows for fines of up to 0.5% of GDP and under German (and Dutch) pressure the December 2011 Fiscal Compact will toughen this procedure up. Germany was one of the first nations to trangress these rules – that they had been instrumental in establishing. When it came to implementing the Stability and Growth Pact in a rigorous manner, the first test was failed. Faced with a need to fully apply the provisions of the corrective arm of the Pact in the autumn of 2003, France and Germany, among others, blocked its strict implementation by colluding in order to reject a Commission recommendation to move a step further in the direction of sanctions under the excessive deficit procedure. 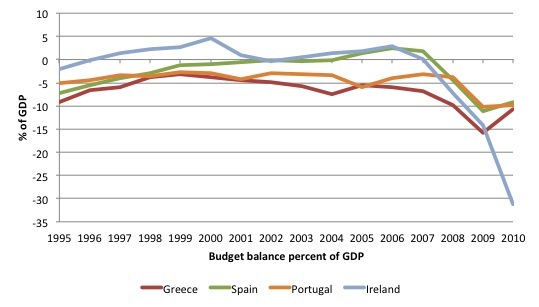 Now consider this graph which shows the budget history since joining the EMU of Greece, Spain, Ireland and Portugal. The intense cyclical deficits are clear in the recent years. If you consider the two graphs together you would find that the only nations that actually ran surpluses in the common period were Ireland and Spain. While Germany and France were “living it up” on budget deficits and then bullying the EU Council of Ministers to turn a blind eye to their (stupid) regulations, Ireland and Spain were acting like model EMU citizens. This juxtaposition is not making a case for punitive action against Germany or France but is rather arguing that the rules are contrary to sound fiscal management and their presence (rather than enforcement) creates an environment – a pretext – for the bullies of Europe – the Troika – to impose whatever ideological slant they want on things. This is not an exercise in German-bashing. It was good that the Bundesbank intervened in 1975 and helped kickstart growth by allowing the budget deficits to rise without pushing up bond yields (and thus, longer-term investment rates). It is good they flouted the SGP rules in the early 2000s and allowed the budget deficits to support higher rates of growth and lower rates of unemployment. But it would also be good if the ECB acted as a fiscal authority and funded growth deficits across the Eurozone – given that the monetary union has no other authority that can do that. The ECB has adopted a role that as part of the Troika it is killing growth via its insistence on fiscal austerity, but in its currency-issuing role it is providing enough support to prevent a major collapse of the system. The latter role is only palliative though given the former. The Eurozone needs economic growth and fiscal austerity will stop that from happening. (c) Copyright 2012 Bill Mitchell. All Rights Reserved. I read somewhere that the LTRO is just a scheme to reduce exposure of French and German banks: e.g. in 2011 German and French banks had 50% of Italian bonds, with the LTRO Italian banks have been buying them back, so now the German and French banks only have 35% of Italian bons. In a while, when German/French exposure is reduced further, Italy can enter a default without tearing down the whole house of cards. A bit off topic, just wondering if anyone happens to know where I can find any papers by minsky(or anyone else) that describe why Minsky thought that J.G jobs must meet the skills of the unemployed rather than simply providing jobs which the unemployed must simply fill. I recall reading this somewhere, but I can’t find where! Thanks very much. I have fixed the link. Minsky suggests that a skilled worker who does not immediately find an equivalent job will suffer a “capital loss”, which I interpert to mean their skills will degrade and make them less desirable to employ. By tailoring jobs to skills the worker retains their value and can more easily transition from the public to private sector once growth has been restored. Thanks for that Ben :).